My son is way into pirate's right now, so I found it only fitting to throw him a pirate themed birthday party. Since his birthday is in June, we're lucky enough to have the entire party outside. I used some inspiration from various pirate parties I had seen online and embelished on them. All the signs, maps, booty bags, favors the bar, and the ship were all handmade. My husband is handy with the tools, so he's nice enough to create what I think up-lol. My son's love of pirates! My son is way into pirate's right now, so I found it only fitting to throw him a pirate themed birthday party. Since his birthday is in June, we're lucky enough to have the entire party outside. I used some inspiration from various pirate parties I had seen online and embelished on them. All the signs, maps, booty bags, favors, the bar, and the ship were all handmade. My husband is handy with the tools, so he's nice enough to create what I think up-lol. I created a table of pirate gear so the kids could suit up as soon as they arrived at the party. Most of the supplies were ordered online from various party supply stores. The kids picked up their hat, eye patch, pirate pouch, hook and treasure map from the table. The treasure chest was bought from Michael's and was a paintable plain wood box. I proceeded to paint it to look more like a chest and filled it with spanish moss and the pirate treasure. "Skully's Sandbox" was our sandbox transformed into a treasure holding sandbox. The treasure map helped guide them to look for buried treasure which consisted of beaded necklaces, pirate coins, skull rings and loose jewels. The kids used their pirate pouch to store all of their loot. No pirate party would be complete without a pirate ship, so we built one that could be used for a photo opt. It was made with scrap wood we had and some paint. Of course for the photo part, trying to wrangle a bunch of kids ages 2-4 to stand together for a photo is easier said than done! We had to have a plank, so we built this out of some 2x4's and rope. Any pirate who caused too much ruckus had to walk the plank, it's the pirate thing to do. For the adults we built a bar stand we aptly called "Scallywag's Waterin' Hole". Here is where the parents could rest up, have a few cocktails and watch their kids run around the yard yelling "ahoy" and "yo ho ho". The "Happy Birthday" sign was designed and created by us. Just designed it up on the computer, did some printouts and strung it up with some natural twine to give it a more rustic feel. The cake was inspired by a cake I saw online....just not sure who to give the credit to. We had a local neighbor make it and it was delish. Once the party was over, the kiddos also got a favor bag filled with pirate gold (chocolate coins) and wood planks that my husband and I made. A little memento for the kids to hang on their bedroom walls at home. Have fun with it and don't be afraid to repurpose things you may already have. Our ship, bar and favors were built using leftover wood we had kept from previous DIY projects. Such attention to detail with the wooden signs. Very nicely done. Pirates are always fun, especially for boys. There’s just a magical and adventurous sort of quality to pirates where boys are concerned, just as mermaids are to girls. Love your treasure chest, by the way. 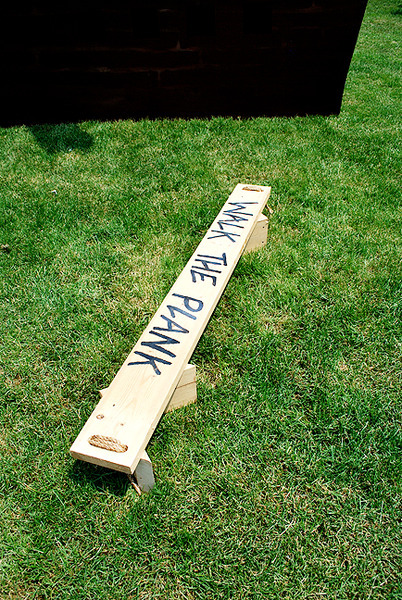 And your “Walk The Plank” is cute and funny. Thanks to both of you! Had a lot of fun creating the components for this party…only wish I had more time to do more! Next party…. Go to the end of the post to grab a button for your page. I love your printables!!! Did you design them yourself? I also absolutely love your watering hole sign for the adult beverages!! Did you paint it yourself? It looks so good!!! Also who made the Happy Birthday Banner? My son’s pirate party is this weekend. I wish I would have found your blog earlier, lol. You threw an amazing party!!! !